Alexander Graham Bell 1st Telephone Design.Good or Bad? and why it is important to ask the question? Did Bell Telephone Work Trickle Down to Help Him In the Development of His Metal Detector? Props and Reexamination of History for a Japanese TV Film Project: Alexander Graham Bell Telephone and Metal Detector. This project concentrated on the development of a metal detector to find an assassin bullet in president Garfield. It goes further though asking the questions what expertise did Bell gain from the development of the telephone that led him to the development of metal detectors? This new expanded TV version of the Garfield story by a Japanese film company for the Japanese market helps make this connection. 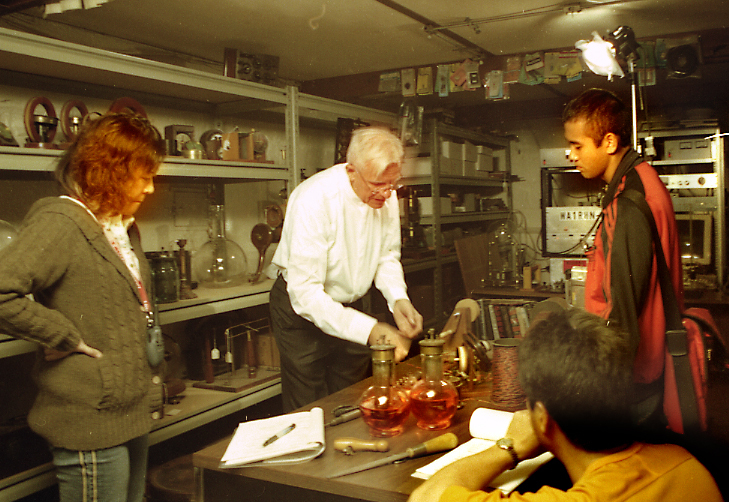 The laboratory scenes for the project were filmed at our location using period instruments from our collection and special props we built in our shops . Click on the number above to more details of each instrument. 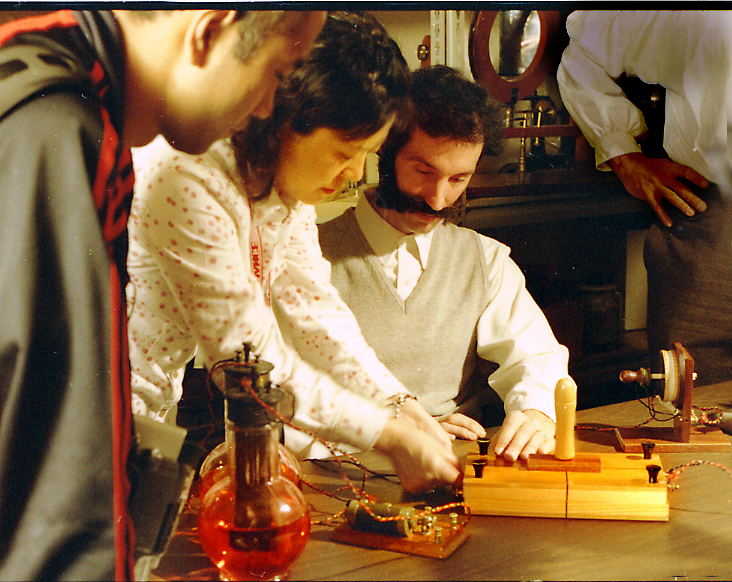 On June 2nd 1875. while working on his harmonic telegraph, in the attic of the Williams machine shop on Court Street Boston, Alexander Graham Bell and his assistant Thomas A. Watson discovered they could transmit more than a single sound note, a timbre electrically through wires from one room to another using iron resonant reeds driven by electromagnets. Because of Bell expertise in sound he immediately recognized the possibility of talking over wires and created his first design. On the 3rd & 4th June 1875 Watson working from Bells design sketches perhaps blending in his own view constructed the first telephone. We built one for this project out of vintage material to get a feeling of how well it worked. Their design did not work nor did ours. Depending on the number of turns of wire we were using on the magnet we were getting microvolts of signal .The membrane diaphragm and reed were not suitable plus the magnetic circuit was very poor. 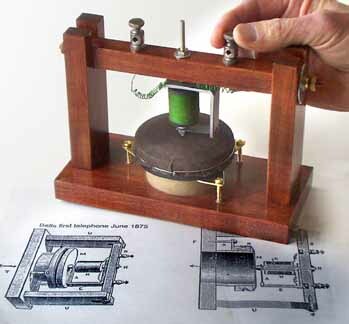 Bell carried out very few experiments on this model and they were unsuccessful from the start. Further work was suspended for nearly a month for a variety of reasons including the displeasure of one of his backers Mr. Hubbard who wanted results on the harmonic telegraph to have a higher priority. Curiously in hind site if. 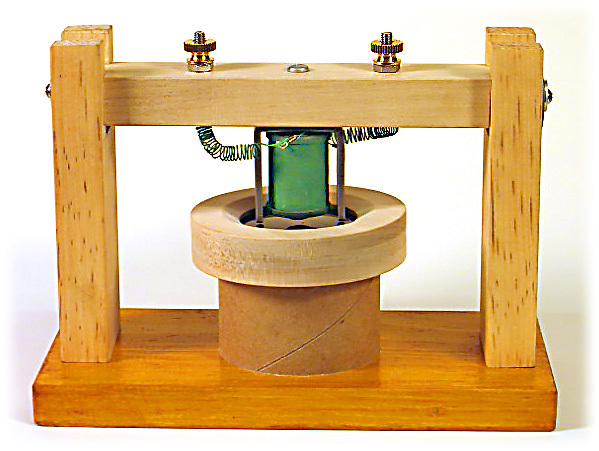 Bell and Watson had used a thin iron disk in place of the membrane and had a permanent magnet iron core in the coil they would have had a successful working model from the start. 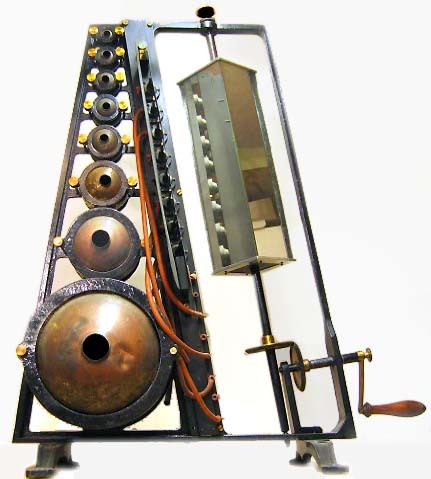 It wasn't until July 1st 1875 when Watson modified the instrument with a heavier membrane and a lighter reed that they began hearing some semblances of voices which was further improved with the addition of another diaphragm instrument for the receiver however the results were very marginal. 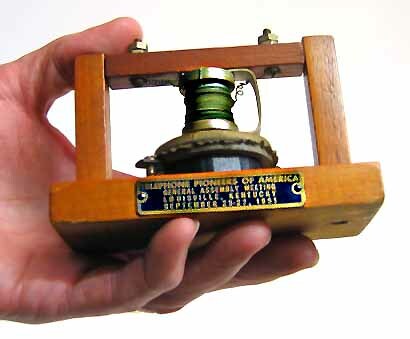 However Bell felt he could eventually make the telephone work and decided to patent lit anyways, Fortunately for Bell and his crew in 1870 patent models were no longer required by law. Between July 1875 and March 8th 1876 nearly 8 months Bell wrote up his patent for the telephone attended to other patents, attended to his job as a teacher at Boston University and worked on his quest to Marry Mabel Hubbard daughter. He was successful on all accounts. on March 7th 1876. He was awarded his patent for the telephone. On March 8th 1876. He went back to the experiments to try and make it work. 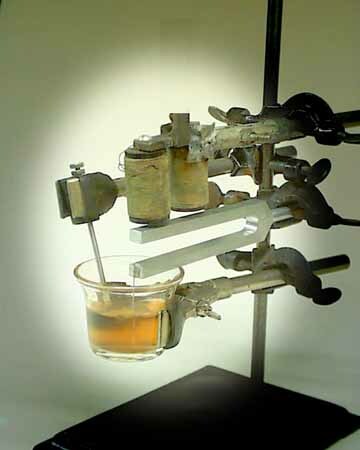 This time He started with tuning forks experimenting with acid pots as variable resistance transmitters. Perhaps this was done instead of continuing with the first magneto design because Bell felt certain that he needed a stronger transmitter for reaching longer distances. 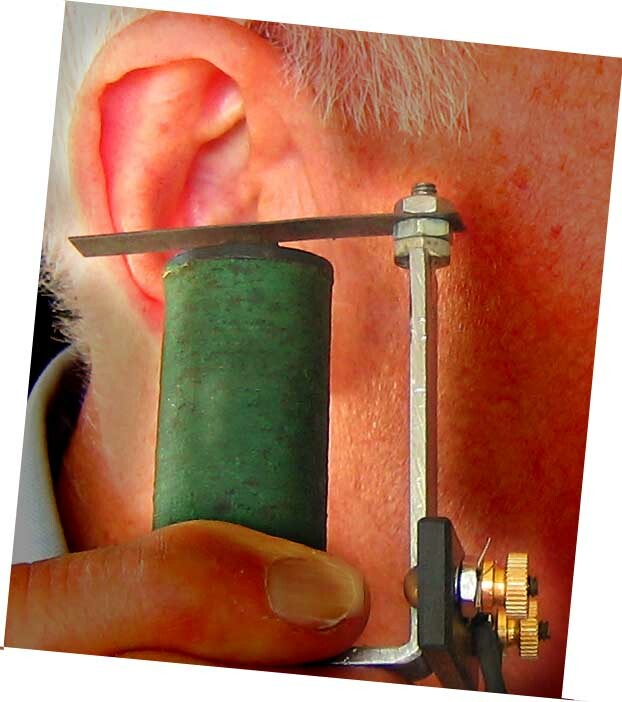 See the general layout of the tuning forks device in the figures and diagram below. Thomas Edison finally worked out a successful variable resistance microphone using carbon as the sound pressure resistive sensitive element. Think about the prospective of money backers of such a project. There was no appreciation of the strong acceptance that public would have for keeping in touch with his fellow man and woman. Western Union refused to by Bell company at a ridiculously low price which in few years grew to hundreds of times the initial selling price. Below are pictures of the Japanese film crew working together on the set. Here is the producer, director, and young Bell working out the details of the metal detector for one of the laboratory scenes. Below is the Scientific advisor showing the technical details of the apparatus to the crew in the developing a shooting plan for the next scene. Should the patent office have granted Bell the Patent? Is the little replica below the symbol of success or failure? This is symbolic replica of the original design that failed. Bell realized that he needed to achieve good working distance for a practical telephone and to achieve it he needed to have an externally powered system. Below is one version he tried for a variable resistance microphone using an acid puddle. Koenig Manometric capsule sound analyzer in our collection. and what they tell us about the future. The Alexander Graham Bell story of invention and scientific discovery: how it gets done, how it ultimately gets to the customer, how business manipulates the use and availability of those inventions or discoveries, and who gets the reward both in money and recognition is all very much the same today as it was in Bells time. There are important lessons to be learned from this story. Lessons which are important to us today in every part of our daily living. The Patents and discoveries of today in food production new medicines, communications ( the internet) affect all of us profoundly. Civilizations rise and fall because of technical progress It's important for all of us to understand and make sure that our political representatives and businessmen understand this and demand that we get our fair share of the rewards from these inventions and discoveries. With careless management these resources can be used against us. Millions of jobs move almost over night from one country to another because of technical progress. Tens of thousands of atomic weapons are just waiting to be used because of technical progress. Thus far all of this progress for the most part has been used to make the world a better and safer place to live in Many of us are living longer and enjoying ourselves more than in Bell's time. We cant stop technical progress its in our genes. So we have to be on our toes and continue to use them wisely. After all Bell and his telephone and Sam Morse and his telegraph were not very clever in the science and engineering needed to invent the telephone and telegraph but look what they started and how it has change everyone lives.